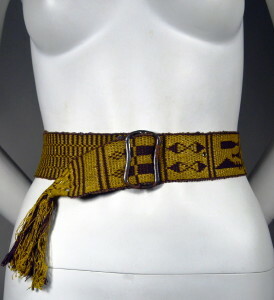 1910's vintage hand woven geometric pattern rustic cinch belt. Cocoa brown and golden yellow with metallic gold cotton, brown faux leather, silver metal. Woven belt with knotted tassel end. Burnished silver metal applied with top stitched faux leather. RARE cinch belt for sport or garden wear. Length including tassel- 28 1/2"
Length to 1st eyelet - 23 3/4"
Length to 2nd eyelet - 26"
EXCELLENT! Shows some light wear/patina & rust at buckle consistent with age and soil mark at end.